This is going to be a very short entry today. Not because I don’t have tons of books, but because I went on a Laurell K. Hamilton binge and I’m going to deal with all of those at one time. 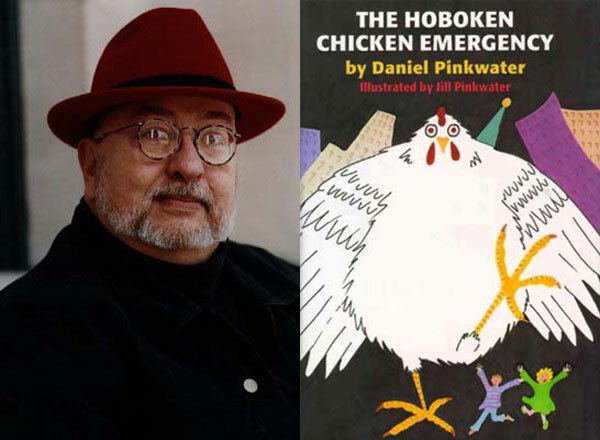 So, today I would like to talk about one of my favorite children’s authors, Daniel Pinkwater. Daniel Pinkwater is an author and an ambassador of children’s literature. He appears on NPR frequently to discuss and even read children’s books. A bookseller in Boston once told me that they had a standing instructions to order at least twenty of any book he read from. He introduces people to books they might not otherwise find. He also writes books the likes of which you’ll never see from anyone else. A Daniel Pinkwater book is a thing apart. It is full of offbeat humor and references to art, philosophy, and occasional giant chickens. I first learned about the amazing Mr. Pinkwater in college. (I’m a late bloomer.) One of my friends introduced me and we have had a very cordial relationship ever since. My favorites are: The Neddiad: How Neddie Took the Train, Went to Hollywood, and Saved Civilization, The Hoboken Chicken Emergency, and Fat Camp Commandos. This is not to say that his other books are not good. They are. It is just that one must have favorites and these are mine. Take them as you will. I also very much like audiobooks. Daniel Pinkwater has been so kind as to record many of his books. Some of them are even available for the low, low price of free! Some of the others are available elsewhere for slightly more. I highly recommend any of them. Or all of them. Whatever your budget and inclination suggest. This is a sequel to The Snarkout Boys and the Avocado of Death, which is also very good. I got this particular book on audio, read by the author (the only way, accept no substitutes). Winston Bongo is our intrepid hero. He and his friends, Walter Gault and a young lady named Rat enjoy eating at questionable restaurants, investigating mysteries, fleeing from werewolves, and snarking out. Snarking out is the grand tradition of sneaking out to see movies at the Snark Theater. There are beatnik poets, bad coffee, a swami, and questionable butlers. Really, there is something for everyone. I can’t exactly explain the plot of a Daniel Pinkwater novel. It doesn’t work like that. I could tell you, but it’s better if you discover it for yourself. Which you can listen to The Snarkout Boys and the Avacado of Death for free, right here, to see if you’d like it.